"I had lost hope of finding a dress that day, my earlier appointment at another shop failed to give me any hope. Being pregnant was starting to show and I knew it wouldn't be long before trying on dresses became unrealistic." "My mother, aunt, sister, sister in law and two of my very best friends." "Nothing at all like I had in mind, this dress totally exceeded my vision!" "Amazing! Sharon was so helpful and sat with us prior to pulling some dresses. She really listened to what I wanted and envisioned. It was an amazing experience!" "He loved that it was backless and expected me to wear something similar to what I picked! He knows me so well!" All photographs by C & T Photography. Join us next week, for a post all about Jordan and Daniel's wedding day! If you are feeling hopeless about finding your dream dress, don't settle! Book your appointment at Once Upon A Time Weddings for a true bridal experience! So we can't deny how aaaaamazing Pinterest is and how great of a tool it is for wedding planning BUT it can quickly become very overwhelming when you've become a bride! We've put together some tips to remember when using Pinterest for planning your wedding. 1. Create a "mood board." This board will help you keep your overall theme in check when pinning: do the table cloths and centre pieces fit your overall theme? Do these decorations match the feel I'm going for? 2. Set realistic expectations. If you have a tight budget remember that when looking through Pinterest pictures, those wedding pictures you're finding might have been from a budget 4X yours. So many things these days can be done DIY, so use that to your advantage! Collect wine bottles from family + friends and spray paint them, super affordable and chic! 3. Use secret boards. If you have ideas that you are actually using do you want your guests to see the original and then your version? Or maybe you've pinned your dress, do you want your guests to see it before you walk down the isle? Maybe just add your bridesmaids as contributors so there's an extra set of eyes + ideas! 4. Search for tips and tricks. Don't just use Pinterest for 'inspo', actually click on the links and use the resources that are available for DIY'ing, tips on how much ice you'll need for the bar, what props to stock your photo booth with, and so on. Do you follow us on Pinterest? You should! Click here! Still searching for your dream dress? Make an appointment with us today! Spotlight On A Wedding Vendor - Beauty by Mallory. On this Spotlight On A Wedding Vendor, I got the opportunity to discuss hair & makeup with Mallory Antone, owner of Beauty by Mallory. One of the biggest mistakes we both see in wedding planning is brides thinking they don’t need to hire a hair and makeup artist. Often, it’s something that brides think they can cut out of their budget or sometimes it’s just not seen as a necessity. This often leaves brides scrambling at the last minute trying to find a professional hair & makeup artist who is still available for their wedding day. Unfortunately it can be one of a brides biggest regrets after the wedding. After all, it’s wonderful to start your wedding day feeling pampered. Having your hair & makeup professionally done will also make a huge difference in your photographs, which are your only keepsakes from that day. Beauty by Mallory, provides on location hairstyling and makeup artistry to brides and their bridal parties. She is also a fully trained and licensed salon hairstylist. The best part of her job Mallory says is that she, “loves meeting people and creating a fresh look that makes them feel as beautiful on the outside as they are on the inside“. Mallory says there are three mistakes she sees too many brides making when it comes to their hair & makeup for their wedding day. 1.) Not booking a trial or not leaving enough time for a full trial. 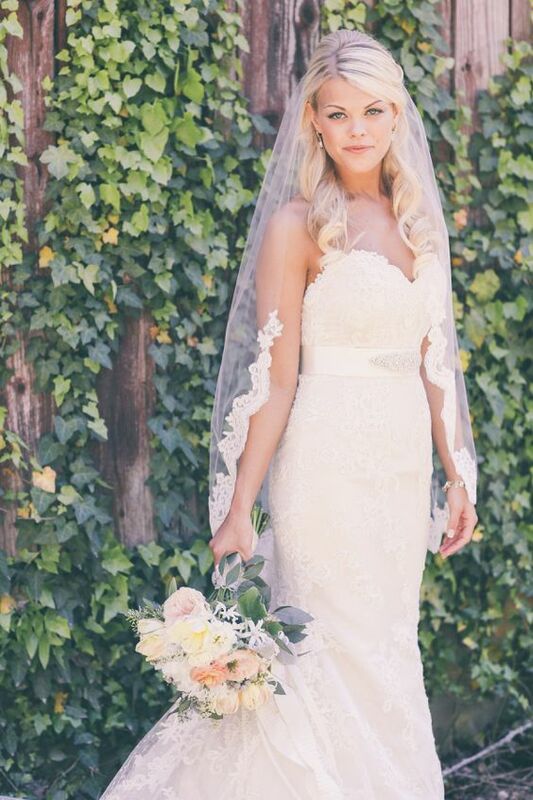 She says, “trials are important for us to get to know each other and find the perfect style for your big day.” She likes to book trials about 3 months before a bride’s big day so they can enjoy the process and not feel rushed. 2.) Not bringing the essentials to your hair trial. She recommends bringing your earrings, veil, hair clips, necklaces, headbands or any other accessory that you would like to incorporate so you can see the finished look with your and makeup done. 3.) Not making an educated decision on who your stylist should be. Mallory suggests that you shop around and know what to look for in a safe and professional stylist. Ask for their training background and ask to see photos and read reviews of their past work. Cheaper is not always the best bet, but there’s no guarantee that the most expensive service provider is the best fit for you either. If you have any other questions or would like to book Beauty by Mallory’s services please contact her.